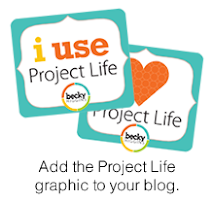 I am Sarah, a stay at home mom of two wonderful, little boys. In my life before kids I was a fifth grade teacher. I now work with first year teachers, which I love. Creating is one of the ways I stay sane. I become very cranky if I have not stamped or scrapped in a while. Join me on this creative journey. 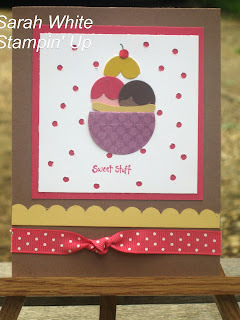 This card is a CASE from Stampin' Success which is a magazine you receive if you are a demonstrator. I saw it and had to give it a try, it is such a happy card. 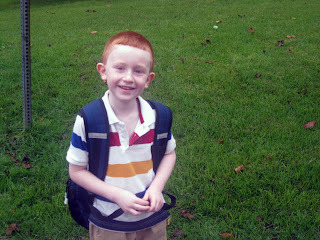 Yesterday was the first day of Kindergarten for Reid. 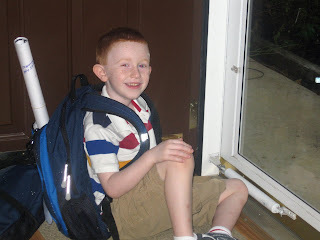 He was so excited to go. I was a little nervous. 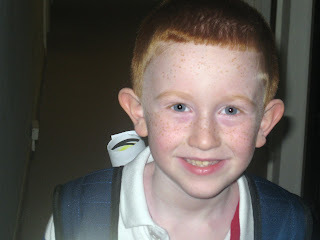 I got him on the bus and then drove to the school to make sure he got there, I know crazy Mamma! I do think it made us both feel better. Now I just have to get Elias on a good schdule, he is not use to waking up so early. I will leave you with some photos from that day. Enjoy and thanks for stopping by. adorable card, and great pictures. Adorable card, congrats and hope he has a great school year! I like your card! It's one of the ones I want to try from the SS...nice work & great pics!! Great card and I hope his year is fun! Page Kits & Pre-Made Layouts Going on Sale! Christmas Cards are here again! All content are (c) Sarah White. My artwork is shared for your personal enjoyment and is not intended for submission to contests, publication or for personal monetary gain.